Twenty-one year old Cornishman Richard Sharp, an eleventh-hour replacement, made a dream Test debut, guiding England to a convincing 14-6 win against Wales at Twickenham. "In 25 years of watching rugby internationals I cannot remember a newcomer so dominating the field of play or so electrifying a capacity crowd," wrote Peter Wilson in the Daily Mirror. There was added cause for celebration when another new caps - Jim Roberts - score England's opening try as it was their first for 23 months. Adverse publicity surrounded the Wales-England match when English forward Geoff Frankcom was bitten on the cheek by a Welsh forward. "' I couldn't tell you who the biter was, though one or two of the lads seem to know a bit more about it," he said. " I wasn't so much angry about it as flabbergasted that somebody would do a thing like this." But later that night at the post-match dinner Frankcom leapt up pointing at Brian Thomas, reportedly shouting "It's him, it's him. He's just refused a third helping of beef because of what he ate this afternoon." Thomas was not picked again for the remainder of the season. Wales won 14-3 thanks to a brace from wing Stuart Watkins, watched by Hollywood A-listers Richard Burton and Elizabeth Taylor.At the after-match banquet Frankom suddenly pointed a finger at a Welsh forward, "It's him, it's him. He's just refused a third helping of beef because of what he ate this afternoon." Wales beat England 22-6 to go ahead in the series for the first time since 1912. Gerald Davies scorched over for two corner tries in his first Five Nations game as a wing. 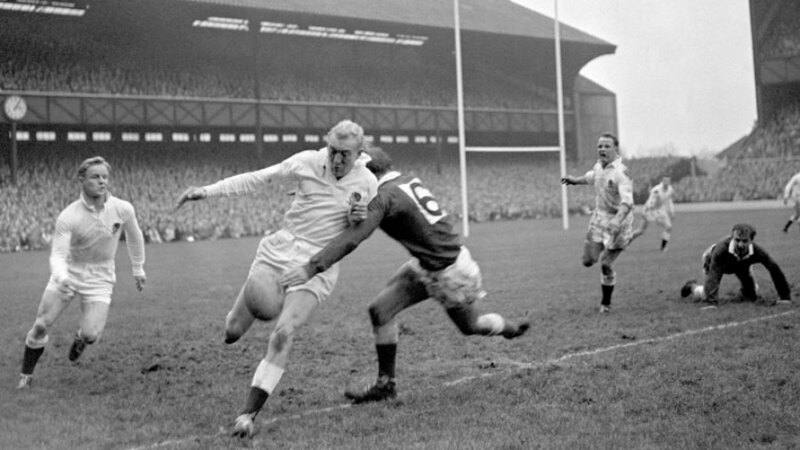 Davies had played his first 12 Tests in the centre before shifting to the wing on tour to Australia in 1969 at the insistence of Welsh coach Clive Rowlands. John Bevan, making his debut, also scored a try as Wales marched towards a Grand Slam in a British & Irish Lions year. Wales's 12-5 defeat of England in Swansea was their first win against the old enemy for ten years. On the same day South Africa beat Scotland 6-3 at Murrayfield to complete their second Grand Slam tour of the Home Unions. The first all-ticket Twickenham international match. Chris Winn's late try gave England a 9-6 victory over Wales. The visitors has to play most of the match with 14 fit players after fullback Gerwyn Williams dislocated a shoulder in a tackle, the second time he has suffered such an injury. "I think I've had it," he said. "I don't see how my shoulder can stand up to the game in the future." And had it he had. And Pat Marshall of the Daily Express described the match as "79 minutes of thuggish brawling which I found uninspiring and slightly nauseating". The IRB ruled that half-time would in future last for ten minutes and that players may leave the field during the interval. Until then they had remained in a huddle on the pitch during a short break. In only the second cap-match between the sides, Italy ran Wales close before losing 31-26 in Cardiff. Debutant fly-half Arwel Thomas was Wales's main scorer, kicking two conversions and four penalties, while a brace from wing Ieuan Evans beat an effort from former Wallaby Julian Gardner, playing No.8 for the Azzurri. In his first game as England team manager Geoff Cooke saw his side give France a shock in Paris. France won 10-9 but England were unlucky to have a claim for a try by Micky Skinner turned down. Skinner was making his Test debut, as were centre Will Carling and prop Jeff Probyn, but all were disappointed thanks to a try from French No.8 Laurent Rodriguez.